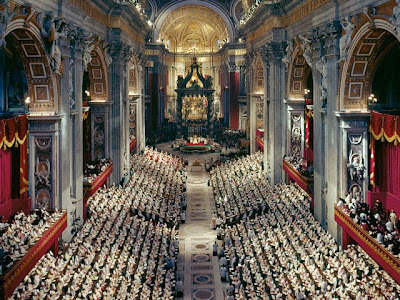 Since the promulgation of Sacrosanctum Concilium, much ink (both real and virtual) has been spilt over what Vatican II said about the liturgy. Considerably less, however, has been used in examining what was said about the liturgy at Vatican II. This is perhaps due to the Acta Synodalia - the record of all the spoken and written interventions made at the Council - being quite difficult to get access to. Unless one has access to an excellent library that has the Acta, or is prepared to shell out quite a bit of money to purchase all 26 volumes, the chances of being able to personally consult them is small. As well as this, the Acta is, as one might expect, almost entirely in Latin, which is an obvious barrier for those who do not know the language well. The Council Fathers - but what did they all say? Chapter 3 of American Participation will be of special interest to NLM readers, as it is that chapter that collects the interventions of the U.S. Bishops on Sacrosanctum Concilium. A PDF scan of this chapter can be downloaded here! However, with regard to the Acta, please keep an eye out over the next few weeks for news regarding an exciting project! For instance, Fr Joseph Komonchak has translated into English some of the preparatory schemas drafted before the Council: the draft De Ecclesia can be found here, four other draft schemas can be found here, and a pretty good essay examining the suggestions (votum) submitted during 1959-1960 by the U.S. Bishops for what the Council should discuss can be found here. Also, though they do not contain any full texts of speeches, it is worth mentioning that the diaries of Yves Cardinal Congar, O.P. and Henri Cardinal de Lubac, S.J. have recently received English translations: Y. Congar, My Journal of the Council (Collegeville, MN: Liturgical Press, 2012); H. de Lubac, Vatican Council Notebooks: Volume One (San Francisco: Ignatius Press, 2015). Diaries and journals are, however, very personal (and often very frank! ), so, as interesting as they can be, if one is looking for a more objective account of Vatican II then they are perhaps not the best resources to begin with! Yzermans recounts that, in reply to his request for copies of spoken and written interventions, Bishops Alexander Zaleski (Lansing), Lambert Hoch (Sioux Falls), Ignatius Strecker (at that time of Springfield-Cape Girardeau) and Floyd Begin (Oakland) said that they had not kept any copies! Indeed, Bishop Begin said that the same was likely true of many other bishops (cf. American Participation, pp. 5-6).